Artificial intelligence — the topic of one of this year’s January Term courses — played an important role in science projects presented by two University High School students last month. In the state science fair, sophomore Caine Ardayfio’s project earned second among all 10th grade students. Ardayfio earned a spot on Indiana’s team that will compete in the Intel International Science and Engineering Fair in May. Working with Dr. Brandon Hogan, sophomore Caine Ardayfio used an artificial intelligence algorithm to discover a way to make solar panels more efficient. His project, titled “Development of optimal microstructure in organic solar cell active layer through genetic algorithm” advanced to the 31st annual Hoosier Science and Engineering Fair on March 30, 2019. 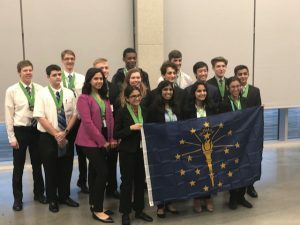 There, he won the Award for Excellence in Environmental Science Senior Division and a cash prize, second place overall in the 10th grade category, and a spot on the Indiana team that will compete in the Intel International Science & Engineering Fair in Phoenix next month. 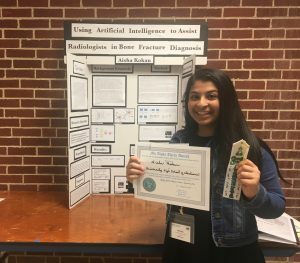 Freshman Aisha Kokan’s project on using artificial intelligence to identify bone fractures won her the Mu Alpha Theta Award at the regional level. Freshman Aisha Kokan also participated in the Central Indiana Regional Science & Engineering Fair. Her project, “Using artificial intelligence to assist radiologists in bone fracture diagnosis” used a neural network algorithm to distinguish between images of healthy bones and fractured bones. She was able to achieve about 80 percent accuracy, and she hopes to fine-tune the algorithm and use a larger data set to increase the accuracy next year. Kokan’s research won the Mu Alpha Theta Award for the most challenging, original, thorough, and creative investigation of a problem involving mathematics accessible to a high school student at the fair.